The U.S. Mint confirmed in a press release yesterday that it will go ahead with plans to reissue gold versions of three classic 1916 coins a century after their original debut. 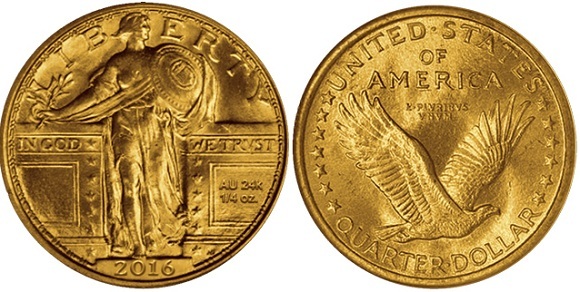 The 1916 dime, quarter, and half dollar — originally 90% silver and bearing designs known as “Winged Liberty,” “Standing Liberty,” and “Walking Liberty,” respectively — will be issued in .9999 24-karat gold some time in 2016. The reissues will vary in size, roughly in accordance with the dimensions of the original pieces. The Winged Liberty dime will come as a 1/10 oz. piece, the Standing Liberty quarter will be 1/4 oz., and the Walking Liberty half dollar will be the largest at 1/2 oz. Further information regarding mintage levels, release dates, and pricing for the coins will be announced next year. The following images are mock-ups of the proposed gold issues, shared by the Mint last June. The Winged Liberty dime was designed by Adolph A. Weinmen. It’s obverse features an image of Liberty facing left and wearing a winged cap; Liberty’s resemblance in this design to the Roman god, Mercury, led to the issue being nicknamed the “Mercury dime.” Inscribed along the rim are LIBERTY, IN GOD WE TRUST, the mint mark, and the year of issue. The coin’s reverse bears an illustration of a Roman fasces with an olive branch, along with the inscriptions UNITED STATES OF AMERICA, E PLURIBUS UNUM, and ONE DIME. The Standing Liberty design was created by Herman A. MacNeil. The obverse image features Liberty standing with a shield and an olive branch before a wall marked with 13 stars. The reverse design bears the image of an eagle in flight with 13 stars placed along the rim; the inscriptions UNITED STATES OF AMERICA, E PLURIBUS UNUM, and QUARTER DOLLAR occupy the field around the eagle. Adolph A. Weinman also designed the Walking Liberty half dollar. The obverse design features Liberty walking to the left, moving toward sunrise while bearing branches of laurel and oak, which symbolize civil and military glory, according to the release. The American flag unfurls behind her. Inscribed on the obverse are LIBERTY, IN GOD WE TRUST, the mint mark, and the year of issue. The reverse bears the image of an eagle rising toward flight, surrounded by the inscriptions UNITED STATES OF AMERICA, E PLURIBUS UNUM, and HALF-DOLLAR. The reverses of these coins will feature the additional inscriptions AU, 24 K, and a numerical fraction detailing the piece’s weight in ounces. To learn more about the U.S. Mint’s gold collector coin program, please visit its Web site. Regarding including the inscription of “AU” onto the reverse sides of these gold coins, Aurum is the Latin name and the chemical symbol for gold. However for numismatists, “AU” can also mean Almost Uncirculated. Therefore I would have preferred the inscription Gold instead of using the symbol “AU”. For those who remember the Chevrolet Nova car in 1962. The Nova was also sold between 1972 and 1978 in Mexico and other Spanish-speaking countries, primarily Venezuela. It sold poorly in those countries because the name Nova translates into Spanish as “doesn’t go”. Who wants to buy a car that “doesn’t go”. AU Stamped 24k is very much a known quantity. AU is a grading symbol that does not ever appear on a coin . Only on a grading tag. The dime and quarter should be struck in both gold and platinum and if the mint offered a five coin set with this combination, it would be absolutely gorgeous. btw, it will be Au not AU. 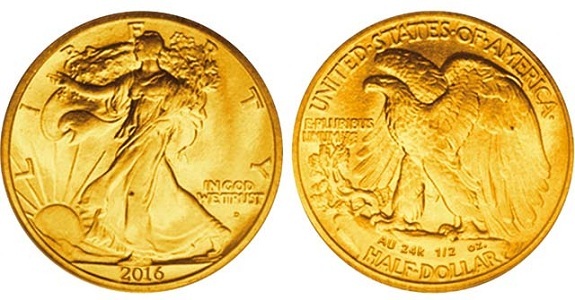 In regards to the size of the next year’s 24k Gold Walking Liberty Half Dollar, its weight will be ½ troy oz. By comparison, U.S. Mint 90% Silver Half Dollars were made to standard specifications of weight 12.5 grams, 30.60 mm diameter and 2.15 mm thickness. Last year’s 2014 JFK 24k Gold Half Dollar was designed to be the same size as the 1964 JFK 90% Silver Half Dollar. Since 24k Gold is denser than 90% Silver by 86.7%, that means the 2014 JFK 24k Gold Half Dollar had to be 86.7% heavier than the 1964 JFK 90% Silver Half Dollar. The 2014 JFK 24k Gold Half Dollar specifications had weight of 0.75 troy oz. (i.e., 23.3 grams), 30.61 mm diameter and 1.64 mm thickness. Since 24k Gold is denser than 90% Silver by 86.7%, that also means for the same size dime, quarter and half dollar to be minted in pure gold for 2016, they will be 86.7% smaller in size than their original 1916 designs in 90% silver. 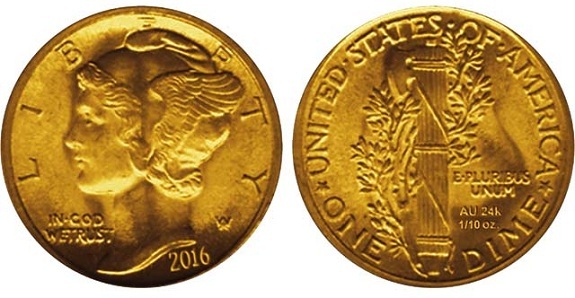 IF the half dollar gold coin next year has the same diameter as the JFK Gold coin 2014 has the thickness will be 2 thirds of 1.64mm. Makes 1.0933 mm thickness. As simple as that. And AU does not mean “almost uncirculated” on next years half dollar gold coin. The weights at 1/10 th 1/4 & 1/2 oz Keep the coins affordable. i’m stretched with all the offerings. Correction to my previous comment: Since 24k Gold is denser than 90% Silver by 86.7%, that means for the sizes of the dime, quarter and half dollar to be minted in pure gold for 2016, they will have to be 86.7% of their 1916 original designs in 90% silver. In other words, they would be 13.3% smaller by either reduced diameter or thickness or some combination of both in order to meet their required pure gold weights of 1/10 troy oz. ¼ troy oz. and ½ troy oz. respectively. This is cool. However, it would have been really cool if they would have made these be in clad for circulation to the general public just for 2016. Just have them be circulated along side the other coins, like the sac and presidential dollars co-existed in the same year.